Ultrasonic Cleaner is one in every of the wide demanded product that we tend to are considered an esteemed manufacturer in the market. It will be simply fitted with casters to enable its portability from one place to a different with ease. It typically finds application in analysis institute, optical lens, eye hospitals, PCB cleaning and for dental/eye surgical instruments. 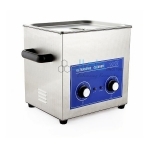 The compact design of our Ultrasonic Cleaner makes it simple to use at varied places as it takes little space on shop floor. Jainco is renowned Ultrasonic Cleaner, Ultrasonic Cleaner Manufacturer, Ultrasonic Cleaner Exporter, Ultrasonic Cleaner in India, Ultrasonic Cleaner Suppliers, Ultrasonic Cleaning System, Ultrasonic Cleaning Machine, Ultrasonic Cleaning Equipment.